Plate levelers are typically used for leveling thin and heavy gauge materials. They typically have individual roll control (position/force) and individual roll drive. With closed loop positioning control it allows for generating machine setting recipes for common plate runs. 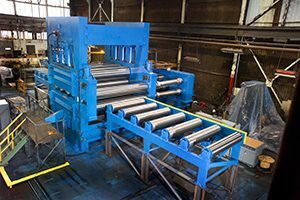 Element has supplied roll combination plate levelers between 3-roll and 8-roll arrangement designs. A leveler can be used to remove flatness defects from many different materials. 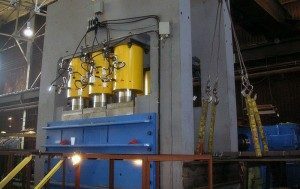 Element Machinery has built levelers for correction of flatness defects in materials. The yield strength of the material also determines the over all size of machine necessary. Our Plate Levelers have met a wide variety of multiple applications they have also been used in different industries as well as have been built with the following options.